Quick review: 4.75/5 stars- SEE THIS MOVIE!! I love it. So much. The characters are well developed and fun. The plot is believable and still totally, “Aww, my feewings.” One of the best rom-coms to be released in recent years. There will be spoilers. Now you know. And knowing is half the battle. Ok, first a confession. I love food movies. “Julie and Julia,” “Chocolat,” and “No Reservations” are always among my go-tos when I’m feeling down and need a little reassurance that life is beautiful and tasty. I also have a budding love (as does most of America) for the Indian aesthetic. “The Best Exotic Marigold Hotel” and “Million Dollar Arm” were both thoroughly enjoyable, and I can’t wait to review BEMH’s sequel in March. So when you combine those two and set them in France and add Helen Mirren you have essentially created my ideal rainy day movie. The characters are lovable from the very beginning and your heart goes out to them. You appreciate their capacity to adapt, move forward, and resourcefully deal with the conflicts in front of them. If I had a place for improvement, I wish the film were just a little longer so as to develop the romance between Hassan and Marguerite a bit more. Also, if I may draw your attention to the poster, Helen Mirren’s character, Madame Mallory is not the main character. She is simply the biggest actor and therefore gets her lovely mug in the middle. I love Helen Mirren. And she does not disappoint in the film at all, but the advertisers could certainly be a bit more honest about the balance of the film, as well as give the due credit to Om Puri and Manish Dayal, who have become two of my new favs, and I hope to see them often in the future. Manish’s portrayal of Hassan, the young man with the potential to be a great chef, is balanced and endearing. He is manly and a little arrogant, but not overpowering. He is deep and thoughtful and proud, but not so prideful as to close himself off to the possibilities around him. He is, simply put, one of the most sympathetic and well rounded male characters in a romance that I have ever seen. He makes me happy. And unlike other rom-coms where the balance between the romance and comedy can be iffy or forced, this is just brilliant. So much to laugh out loud about, but with real stakes in the plot and relationships of the characters. I never felt put off by a joke or felt like the romance was over the top or the comedy out of place. It was all harmoniously synchronized. See this movie!! Own this movie! It is funny, it is heartfelt, it is clean, and my husband liked it, too. P.S. If you would like to ignore the following rant scroll no further. On the subject of awards: too often, way too often, those who are considered the gatekeepers- the ones handing out the shiny trophies- completely overlook the best performances, the best actors, the best writing, plots because they are too well, good. And by good I mean in an all around, decent, uplifting, and moral sense. When you walk away from a film feeling really pleased that you continue to be part of this little planet, chances are that film will get snubbed. I cannot begin to imagine all the reasons why, but a large one seems to be that those in charge of telling us what is award worthy have been chewing on edgy and dark for so long they have lost their sense of taste. The more I live my life, the more I appreciate good drama that doesn’t rely on the graphic, vulgar, and obscene. I respect great acting wherever it is found, but turning aside some of the best acting in the biz for the sake of seeming trendy and “on,” only proves that the gatekeepers have forgotten how to do their job. They are no longer the discerning folk to be trusted with handing out the medals. Yes, Helen Mirren was nominated for a golden globe as best actress in a comedy, but I’m not sure she deserved that particular nomination, especially given that Puri and Dayal’s acting was superior (in my opinion) and neither of them were acknowledged. 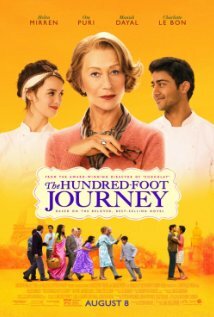 Moreover, as it so often does, the Academy turned a blind eye to “The Hundred-Foot Journey” entirely, along with “Belle” and “The Good Lie.” (Not to mention about a dozen others that seemed right up the Academy’s alley, but no go.) I guess what I am saying here is that I would like to see moral films, uplifting films, performances that make us better people win. I want, as I always do, the good guys/gals to win. And if they can’t win, they should at least have a horse in the running. Rant over for now.